The two cups here, both made for use in churches, reveal the differences in traditions and styles that European Catholics and Protestants brought to the Americas. The glorious chalice contrasts with the more humble cup. Protestants at this time were distancing themselves from what they considered to be the excessive trappings and rituals of the Roman Catholic Church. The Catholics in Mexico City, believed objects used in churches should be made of the finest and most precious materials. The shape of the chalice suggests high status and symbolizes the importance of the Catholic church and the priests who served it. This shape of cup, called a caudle cup, was used in homes to serve a mixture of warm wine and brandy or tea mixed with bread, eggs, sugar, and spices. The silversmith first cast the chalice by pouring silver into a mold. He hammered some shapes out from the inside, a technique called repoussé, then plated the chalice with gold. Silversmith Jeremiah Dummer hammered or raised the cup from a piece of silver. He cast the handles, then applied them to the body. 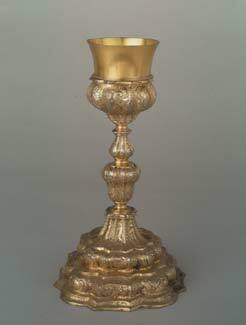 This chalice was made to hold wine during communion. Only the priest drank wine from the chalice. 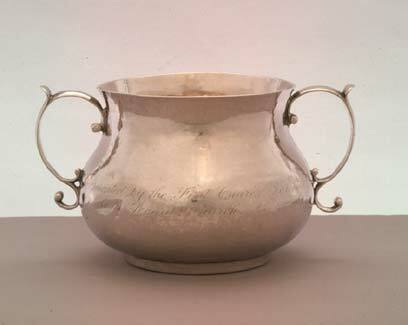 An inscription reveals that a Margaret Thacher first owned the cup. She probably used it in her home. In 1672 she gave the cup to the First Church of Dorchester, Massachusetts where it held communion wine. The many silver mines in Mexico meant that artists had relatively easy access to silver when making church objects. In England and in the British colonies, smiths melted silver coins or old silver pieces and refashioned them for domestic and church use.